In today’s “politically correct” world I would be scolded for laughing at this cartoon. 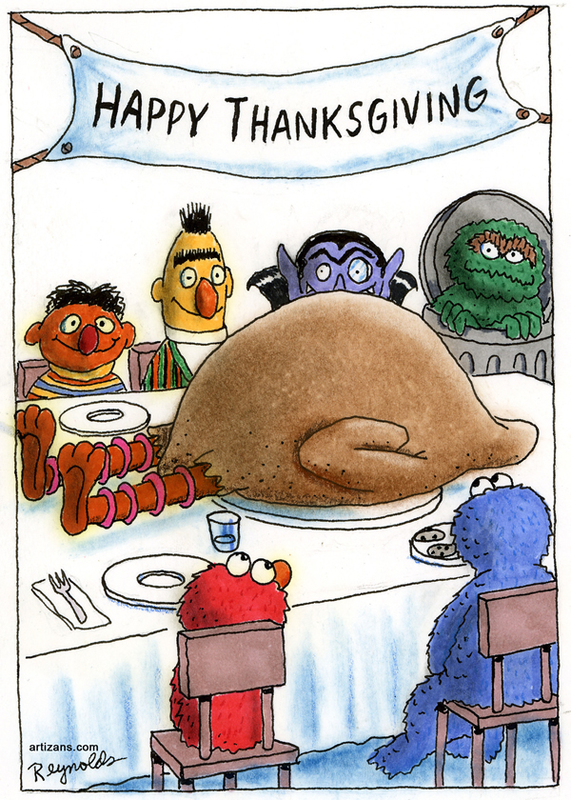 “It’s not funny to laugh about eating big bird”, someone might say. Yes, it is. It is the incongruity of the moment that makes it funny. But that level of humor presupposes a humility that is willing to acknowledge the foibles of all people. We are creatures that deserve to be laughed at when we allow our pretensions to push us into grandiose ideas. The structures we use to define the social range from “redneck” to “aristocrat” are all artificial and capricious ideas that we would do well to review as we grow. Our experience in discovering the benefits and concerns of healthier foods challenge a lot of firmly held prejudices. I am always amused when I see the grimace that crosses the faces of some people when we discuss the value of raw goat’s milk. Often, they have never tried it, but somewhere along the way they have already stored value judgments that reflect an indoctrination by the food processing system that it is either unhealthy or it taste bad. Both ideas are false. I am less amused when I meet whole food “devotees” that attach religious values to their new dietary discoveries. I once was castigated because I tried to explain to a woman why not all cattle have the genetics to thrive in a grass-fed only environment. She was so committed to her newly found truth that the reality the farmer had to deal with was irrelevant. Our friends at Al-Anon taught us the saying above as a method for communicating. It is more challenging than most people realize. For many people “winning the argument” is what it’s all about. They talk “at” you and not “with” you. They believe that having espoused their position they now must provide you with the necessary supplementary material to get you to agree with them. When that transaction doesn’t occur, tempers flare. I once had a friend tell me, “To have an honest conversation with a person of another faith, YOU must first be open to conversion.” That concept is too frightening for many people. 7 Qualities of Rural Life. Having been on this farm since 2004, I am beginning to build a frame of reference that seems to apply to rural life. I invite your comments. 1). Your neighbors are as weird as you are. If they were run of the mill they would not be out here with you. Most of the time that is a good thing. 2). Projects are rarely completely finished. That’s why there is always room for improvement. And that doesn’t mean they stopped trying. It might mean that priorities changed or opportunities were seized because they were more expedient. 3). You must be willing to give and accept help. Stuff breaks down, accidents happen and there aren’t many government services to clean up your mess. 4). If you don’t have time to talk for a few minutes then you are too damn busy. When you violate this concept, you would do well to admit it and make up for it. Forgiveness is a staple here. 5). Seasonal changes are there to stretch, heal, encourage and invigorate you. You don’t want it to be sunny and 72 degrees forever. 6). If everyone could have what you have without the hard work it entails, they would already be here. 7). Pace yourself with your chickens and cows. Take days off and go to the zoo, the beach and a football game.